Always consistent, solid smoke for the money. Very enjoyable smoke. Great from start to finish. Nice burn, always consistent from box to box. I think the AF Double Chateau is one of my top 5 cigars. I like it size, taste and burn. Great, consistent smoke. Always a nice flavor and after taste. Excellent everyday smoke. Always consistent. Always my go to cigar! Easy light, great flavor, slow steady burn. You will savor this smoke! Always consistent. Excellent smoke, i order a lot of these and always the same solid consistency. This is my favorite cigar and the price at BCP is the best around. Can't beat it! my favorite choice for every occasion. My experience with the Aurturo Fuentes Double Chateau, has been top notch. 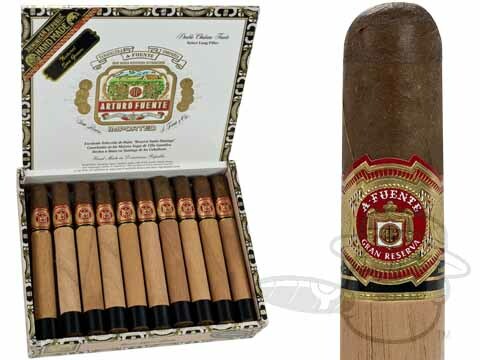 As a long time smoker of Arturo Fuente Sun Grown cigars I am constantly surprised to find these smokes to be consistant in flavor and quality each and every box. Arturo Fuente Double Chateau Sun Grown is rated 4.3 out of 5 based on 23 customer ratings. What is the difference betweent the Arturo Fuente Double Chateau Natural and Sun Grown? The main difference between the Arturo Fuente Double Chateau Natural & the Sun Grown is the wrapper on each cigar. The Natural has a Connecticut shade wrapper, which is mild and smooth with a light golden brown color. The Sun Grown features a Sun Grown wrapper, which is grown in direct sunlight. This produces a thick, dark and textured wrap, with a little more flavor and sweetness due to the high sugar and oil content. Both versions are listed as a medium-to-full bodied cigar, but the Sun Grown would probably be the fuller bodied of the two with a little more sweetness and a slower burn.